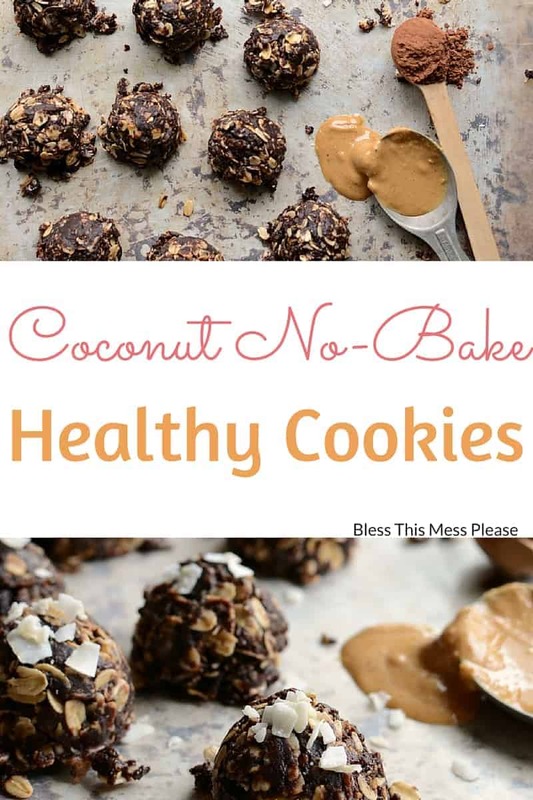 Today’s healthier recipe for coconut no-bake cookies comes from my desire to have sweets but my goal to not have too many. I’m 30ish weeks along in my pregnancy and I’ve gained 40 pounds so far. That combined with the fact that I started out 10 pounds too heavy means that I’m feeling huge. I hit my all-time high adult weight last week and with months left to go, there’s no way I won’t pass it. I’d be lying if I said that it was all just part of pregnancy and I’m ok with it, because I’m not. Being overweight is really hard on me emotionally (and physically!). Part of me feels like it isn’t my fault. I’ve tried really hard to be healthy and I stay pretty active, but my body is tired and hurts constantly thanks to some serious SPD that started months ago. By the end of most days, I have a hard time walking. That being said, I can’t give up completely! I’ve been trying to cut out all sugar and processed foods, including anything with refined grains, and eating a whole lot of vegetables. I’ve been doing great, but last Friday I really wanted a treat. 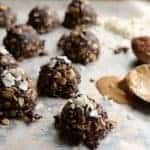 I don’t normally love healthy treats, but I saw this Coconut No-Bake Cookie recipe on Minimalist Baker and I knew they were the treat for me. They were delicious but I was also satisfied with eating a cookie or two. And the plus side (even though I thought of it as a downside) is that my kids loved them. I also liked that it only made about a dozen cookies. Not too many sitting around, tempting me to eat them for breakfast. Not a coconut lover? I’d still try them. The coconut flavor is pretty subtle. 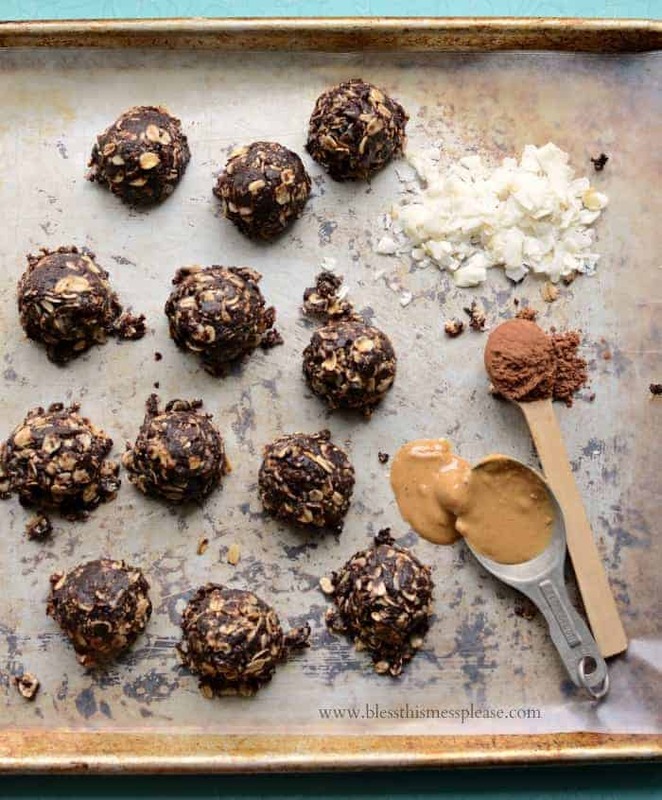 If you try these coconut no-bake cookies, let me know what you think! Leave a comment, pin it, and don’t forget to tag a picture #blessthismesseat on Instagram. I love to see your kitchen skills in action! 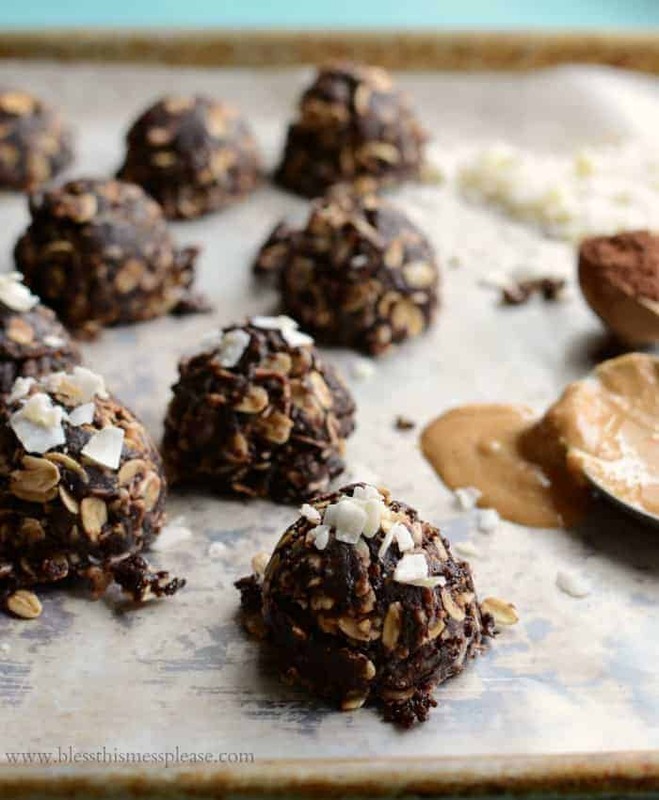 These healthier no-bake chocolate coconut cookies will satisfy your sweet tooth and are kid approved too! In a large saucepan over medium heat add the coconut sugar, milk, coconut oil, and cocoa powder. Stir to combine well. Stirring often, bring the mixture to a gentle simmer and simmer for 1 minute. Remove the pan from the head and stir in the coconut, oats, peanut butter, vanilla, and salt. Stir to combine well. Using a cookie scoop or 2 spoons, place a tablespoon ball of the cookie mixture on a wax or parchment paper lined sheet. Repeat until all of the oat mixture is gone. Let the cookies sit for about 20 minutes to firm up and then enjoy within a day or two. Have you ever tried coconut sugar? Tiffany from Feel Great in 8 introduced me to it and I quite like it. It’s fairly expensive, so I don’t do major baking with it, but it’s nice to have on hand. It’s a pretty dark brown and is supposed to be full of vitamins and minerals. It’s not as sweet as traditional white sugar, but it also isn’t as processed. I like to use it to make kettle corn when I need an healthy sweet snack, and this is the second recipe I’ve used it in. It might be something fun for you to try if you see it at the store. Thanks for letting me share and enjoy this easy treat! This look yummy! I bought some coconut milk and oil and have yet to use either cause I just wasn’t sure what to do with it. This is the recipe I will use them in for the first time!!! I’m making these tommorow. Thanks! Just saw them in the Minimalist Baker blog, and they looked so good!! So cool to hear that they worked out so well for you (and your kids). Honey, love that growing body. I experienced the same (record high!) with one of my pregnancies and I still had plenty of fluctuations since. It means nothing. Love yourself no matter what! You are amazing. Thanks for sharing this Melissa. I wish I could take away all of your pain. You are such a beautiful Momma. And I’m aloud to say that and have you listen to me when I do. MAN! It’s a good thing you get a baby at the end of a pregnancy, because otherwise it’s just not worth it. I’m sorry you’re hurting — and I totally get the weight gain. 10 weeks left and you get a sweet gift from God! Melissa! These are killer. I made them twice last week, they are so so good. Thanks for another great recipe, I always have the ingredients around for these. You truly are beautiful inside and out, these summer babies are hard, but the birthdays sure are fun. I just had my fifth baby and gained 50 pounds with this pregnancy, a new record for me. 🙁 She is almost four months old now, and the weight is slowly coming off. I felt like I should give myself the first 6 months after she was born to let my body recuperate before stressing about it (though I have been trying to eat right and exercising some, of course). I’m now down about 40 lbs of the 50 and starting to see the light at the end of the tunnel. Bodies are miraculous things, and yours is doing miracles right now. So be patient with yourself. The Lord loves you for your willingness to sacrifice in order to bear one of His children, and He will bless you for it, now and forever. And your body will bounce back, not as quickly as it has in the past, but it will get there. PS-you don’t know me, but I found your blog somehow and bought your e-book and I’ve really enjoyed them. And I related to this post, because I am still kind of there. Hang in there, it gets better! Thank you, thank you, thank you. Kind words, even from someone you don’t know, have a way of changing the day. You don’t know how much I needed to hear all that today. And you are right, it’s so good that I get a baby at the end of all of this because I REALLY like that part. This pregnancy business is so hard though, but you are right, real sacrifice doesn’t go unrewarded. Hope to hear from you again, M.